From My Front Porch: God Bless America! I feel like I have a hangover - and I didn't even drink anything! The other day Chris comes to me (a little giddy) with an ad out of the The Farm World and says "I want to go to this tractor pull in Osgood! Look at these classes - it should be a fun and interesting pull"
We do like tractor pulls (A Farmers Heaven On Earth, God Bless Small Town America) so of course there was no twisting of arms for us to go! 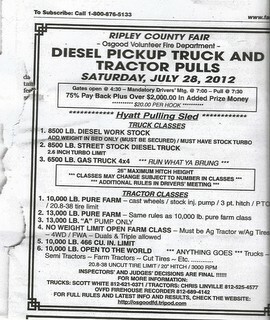 So yesterday evening we jump in the truck and head to Osgood to The Ripley County Fair! I am a people watcher so of course one of the first things I do as we find a seat in one of the coolest wooden grandstands was take a look around at the people I will be spending the evening with - which immediately prompts me to start poking the oldest and pointing at a women a few rows in front of us, whispering in her ear (the oldest not the oddly dressed woman's ear) "don't people look in the mirror before they leave the house, who walks out of the house looking like that" I am just going on and on not relenting on the poor woman when I look down and catch a glimpse of my britches - UNZIPPED, barn door wide open - and has been since I left home, which means I have been walking around The Ripley County Fair for at least an hour with various judgemental people looking (and no doubt laughing) wondering if I bother looking in the mirror before I leave the house!!!! These grandstands were awesome - very much like the ones that recently burnt down in Shelby County, my home county fair as a kid! who got to tailgate in the infield watching the pulls - they looked they were having so much fun and no danged safety fence to watch thru! you couldn't miss it - it was loud and so hopped up that the guy had to keep pushing the gas to keep it running sitting at an idle - I look at Chris and say "I don't get it why would anybody want a car hopped up like that when it won't hardly stay running at idle." What Chris heard was "I don't get it why would anybody want a car hopped up like that when it won't hardly stay running at idle?" - - See the difference, it's settle but it was there-the punctuation - so Chris starts in on this explanation of engines and high octane fuel, it was all probably pretty interesting but really to be it sounded like Charlie Browns teacher talking until he got to the end and said "I'd pay $5 to see that make a run down the track - that's hot - either that or it is misfiring because it is missing a spark plug!" I said to Chris "wonder why that guy is so late?" and Chris said "He probably had to wait for his Mom and Dad to leave for the evening so he could sneak the tractor out for the pull!" - he of course was teasing but we started calling him "Sneaky Pete"-he pulled in the very last class very late hope he got that tractor back in the barn before his Dad woke up this morning ; }! They interspersed the truck pull classes between tractor classes - I am honestly not a big fan of truck pulls where just your average joe pulls in off the road and hooks - after about the 5th drive shaft that drops I want to stand up and yell "Yo Dude your truck wasn't made for this" but of course I don't and just sit thru the next what feels like 300 4-wheel drive trucks to hook and pull, drop a drive shaft and be pushed or pulled off the track! We were towards the end of the track and couldn't really see the start but during one of the truck classes we kept waiting for the next truck to come down the track and finally they called to have it towed - as they towed it down the track the name on the front of the truck was "The Fortune Teller" - I said out loud "Well dang if he is the fortune teller he should've know that hook wasn't going to work" - I. had. the. stands. rolling. - OK fine not everyone in the stands, OK fine Chris thought it was funny but the two gentleman in front of me chuckled also! At one point I looked at Cole and asked if he thought he would ever want to pull when he got old enough, he said "oh yeah but I don't know which tractor to pull with" -I told him I thought it would be cool if he used the 4430 and his eyes got big and he said "I know right where the chrome stack is too" and Chris' eyes filled with fear! The farm classes were great - exactly like Chris loves - tractors right out of the field, turned up some and just pulling for fun! and here we go - have you ever seen 4-wheel drive tractors pull? Here it comes, still coming, I think it's moving, yep here it comes, still. coming. - they. . .are. . .slow. . .and. . .steady - so I just scooted back and used the whole seat cause it was gonna be awhile! We finally decided at 1:30am and 2 kids passed out cold in the truck to head home - it was a long night and I believe that I am getting to old to "party" all night like that but it was fun and so glad that we went! I also learned that while I like hotdogs it should NEVER be the last thing I eat of an evening and especially at 11pm at night!!! !